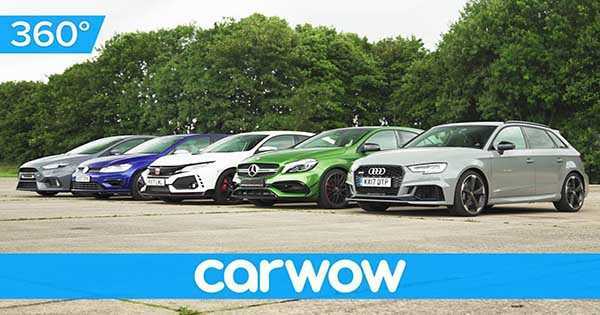 Civic Type R vs RS Focus vs Mercedes AMG vs Golf R vs Audi RS3! - Muscle Cars Zone! Civic Type R vs RS Focus vs Mercedes AMG vs Golf R vs Audi RS3! Okay let`s get down to this one immediately since we have the ultimate drag race including cars that are definitions of a sleeper auto! We always enjoy a good drag race, and when more than two cars are included it only gets better! But what when 5 sleepers are present? Oh, well that`s just a gift from God. So where do we start? The Civic Type R comes in first! Honda`s amazing vehicle is on the starting line with staggering power of 306 horsepower as it is charged with a 2.0 L six speed manual and FWD! Great setup, but we have four more to show off! One of the competitors is the Ford Focus RS. This one goes with somewhat more HP as the number is 350! 350 is also the lb/ft of torque that this machine has to offer! Also, the Michelin 19″ wheels are here to put the cherry on top. And let`s not stop there, okay? The Volkswagen Golf R comes in with its almost 300 HP can accelerate to 60 mph in 5 seconds! How about this addition to the lineup? Who will come out as the winner? That cannot be yet said since we have the Mercedes AMG A45 that deserves a few words as well. This 376 HP beast can take you at 60 mph in only 4 seconds and is a bit faster than the Audi RS3, despite all the conservative claims. However, the sleeper auto drag race can take place and it is our honor to watch! At last, check out this amazing Head2Head drag race!